Almost three million residents and double the amount of tourists fill the streets of Rome during peak tourist season in late spring, mainly along landmark stops such as the Sistine Chapel and St. Peter’s Basilica, as well as the Roman Forum and the Colloseo. Patience becomes a virtue when standing in lines that equal the circumference of Vatican City; be prepared to edge your way through the streets just to grab a table at a nearby pizzeria for a bottle of Chianti and a pizza margherita. 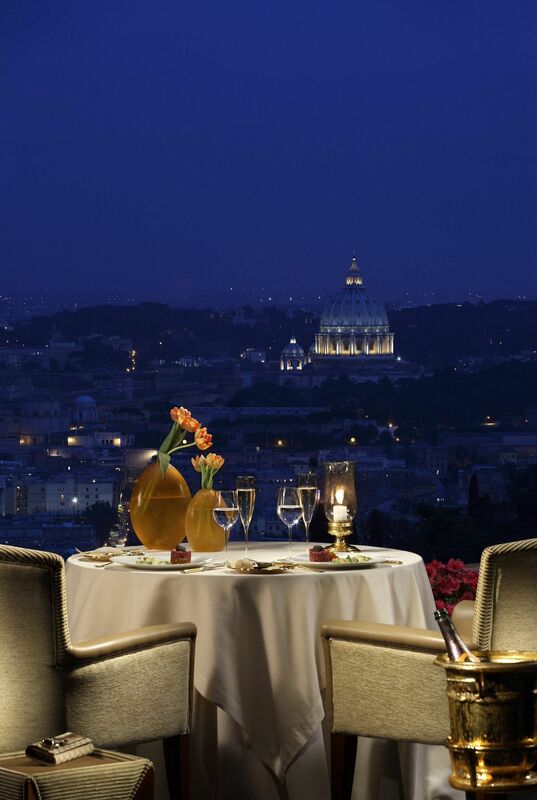 To head out of the crowds to the hilltop resort of Rome Cavalieri is a welcome reprieve. It is here where the indulgence of Roman art and architecture continues in its theme of Baroque and Romanticism eras. Rome Cavalieri is a place of indulgence, decadence and, dare I say, hedonism. I spent time here with my son in celebration of graduation from college, and we felt euphoric as we strolled past the amazing art collection and exquisite décor leading up to our seventh floor room where the “club” is located. First things first, we head toward the outdoor terrace for a look out at Rome, spread before us in the distance. Later that evening we would watch a display of fireworks we saw clearly from a corner spot of our terrace, adding to the magical stay. We decide Rome is larger than we realized, and contemplate where the landmarks might be located before we decided it was time to eat. So we head to the club room where Prosecco flows almost like the water in the aqua ducts we pass by along the streets of Rome. We nibble on tuna sandwiches and the best pistachio cream mousse topped with chopped pistachio nuts. Our good fortune in staying here is proven by next morning, when I overslept, fault be given to the extremely comfortable beds and pillows, and the wall switch that motors a wooden shade to completely shut out the morning light. It made sense that I almost missed my 10:30 a.m. platinum facial. Fortunately, the Grand Spa staff was accommodating. But I had no time to prep. Puffy eyes and no makeup, I rolled out of bed and out of the hotel room, where I walked in to the welcoming arms of two women who spent the next hour and a half mending my tired face and body. While one woman began with a thorough back massage, another took the reins at my feet, slathering lotion and scrub before later covering my feet and hands with warmed gloves that would best allow the moisture to hydrate my dry skin. My eyes were swollen from prior days spent in polluted Paris and the plane ride to get here, but with the circular massage around the cavities of my eyes, in combination with swipes of lotions and the gurgling muscular water therapy tool, I was good to go by the end of a soothing and welcoming treatment. My only regret was in my one-night stay, as I did not get to experience the spa’s full offerings of its Turkish Bath, and we never did get to lounge out at one of the two glorious outdoor pools, or play tennis on the red-clay courts. I did, however, manage to squeeze in a half hour to grab an iPod at the Concierge Desk to learn about the art on the main and lower lobby levels. Paintings re-created from frescos adorned one side of a hallway, while Oriental influences were notable as accents in gold treasure boxes that rested on assorted Baroque tables. Pope Clemente’s silk banner was a nice addition to the plethora of nymphs painted in the Romantic style, just as much as Carlo Grubacs’ 19th century painting depicting Venice’s Piazza San Marco during Carnivale in 1840. The Giambattista Tiepolo triptych closed the art tour with amazing greatness, which is how I would describe Rome Cavalieri.